Hamish Rosie was born in 1940 in the Orkney Isles. At ten months old, a severe bout of meningitis left him profoundly deaf. In 1944 he became a boarder at the Aberdeen School for the Deaf and his artistic talent was discovered at the age of nine by a well-known Orcadian artist and HM Painter and Limner in Scotland, Stanley Curister. Under his influence, the Aberdeen Education Authorities were approached to allow Hamish to study at Aberdeen Grammar School. 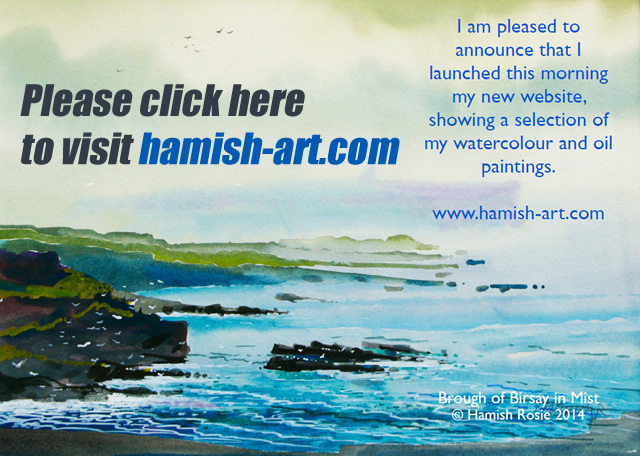 His art tutor was another reputable Scottish artist who greatly influenced Hamish. A scholarship to Burwood Park Technical School in Walton-on-Thames, Surrey followed and from there, he gained a place to Kingston-on-Thames School of Art (Kingston University) and later graduated in 1960 as an exhibition and graphic designer and an artist. Hamish took up his first post as an assistant designer with a reputable London advertising agency and later joined Greater London Council as a senior designer. He also taught part time in typography and graphic design at Croydon College of Art and Design and ran several art projects and classes. In 1990 Hamish retired from GLC, which gave him more time to develop his artistic talents. He continued teaching and providing art projects for children and owned a small design consultancy. From his many one-man exhibitions in Orkney, London, Surrey and Newhaven, he now has many private collectors from as far afield as USA, Canada, Iran, New Zealand and Europe. Hamish and Morag have one deaf and one hearing children. When they were young, we felt we had do something different to change our everyday environment. We joined a deaf and hearing integration group, Breakthrough. We appreciated them for giving us some confidence to improve our communication skills with hearing people and the children benefited immensely. At the same time, Morag was given a role to run Friends for Young Deaf People of which Hamish was very much involved. Hamish loves sport but he devotes his time to his ROSIE family history research. Through the research, he found many surprises and formed new contacts worldwide! Hamish’s biography book ‘My Island’ by his close friend Maggie Gordon was published in 1999. He self published a book ‘My Passion’ about his watercolour and oil paintings. Hamish and Morag run their utilities and telecommunications consultancy, Utility Warehouse Discount Club. As a Joint Honorary Vice President, Hamish is looking forward to cooperating with Deaf Aspirations and their future developments”.